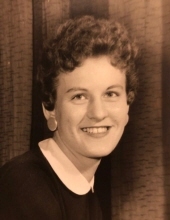 Carol Sue Whitt, 81, of Bowling Green, passed away December 1, 2018 at the Hospice of Northwest Ohio in Perrysburg with her family at her side. She was born on August, 19 1937 in Clyde, Ohio to Erving and Gertrude (Bailey) Berie. On June 20, 1959 she married Dale Whitt at the Clyde First Presbyterian Church. Carol was a loving mother who enjoyed sewing, embroidery, and needlepoint. She was a former member of the Tontogany Presbyterian Church. Carol is survived by her husband of 59 years Dale Whitt, her sons Dale Gregory (Carmel) Whitt and Kevin Whitt, her daughter Brenda S. (Brett) Swanson, her grandchildren Christopher, Stephen and Michael Cleland, Brad (Hayley) and Ryan Babcock, Hunter Whitt, Casey Swanson, and David (Amanda) Miller, her great grandchildren Delilah Babcock and George Miller, and her sisters Barbara (Carl) Pocock and Nancy Rectenwald. She was preceded in death by her parents and her brother Robert Berie. Friends and family are invited to a visitation on Wednesday December 5th from 4 to 8 pm at the Peinert Dunn Funeral Home, 18720 Washington St. Tontogany, Ohio. Funeral services will be Thursday 11 am at the funeral home with Pastor Pam Short officiating. Burial will follow at the Tontogany Cemetery. In Carol’s memory donations are encouraged to the Hospice of Northwest Ohio. To send flowers or a remembrance gift to the family of Carol Whitt, please visit our Tribute Store. "Email Address" would like to share the life celebration of Carol Whitt. Click on the "link" to go to share a favorite memory or leave a condolence message for the family.